Happy Friday everyone! Hope you all are having an amazing week thus far. I literally have nothing "interesting" to report today but since I so freakin' love you all ( and I haven't done this type of post for probably 2 weeks now ) I thought I'd just share another round-up of some of my favorite links and stuff from the world wide web. enjoy these links! 01. Model Caroline Trentini's July 2015 Vogue Spain cover photographed by Paola Kudacki. I am obsessed with her cotton candy pink hair. 02. Them gorgeous nails from Sephora's Beauty Board page. 03. These hand-crafted leather purse from Gift Shop Brooklyn. 04. Frederik Vercruysse's series of marble quarries images called "Tempo Polveroso". 06. Luxury children brand Mischka Aoki's Fall 2015 collection inspired by the Ancient Greek mythology, The Judgement of Paris. 07. Rachel of La Pêche Fraîche's Grapefruit Possets cups with Pistachio Crumble recipe. Sounds delicious! 08. This amazing black and white Brooklyn bachelor's pad photographed by Brian Ferry that is featured on Lonny Magazine this week. 09. 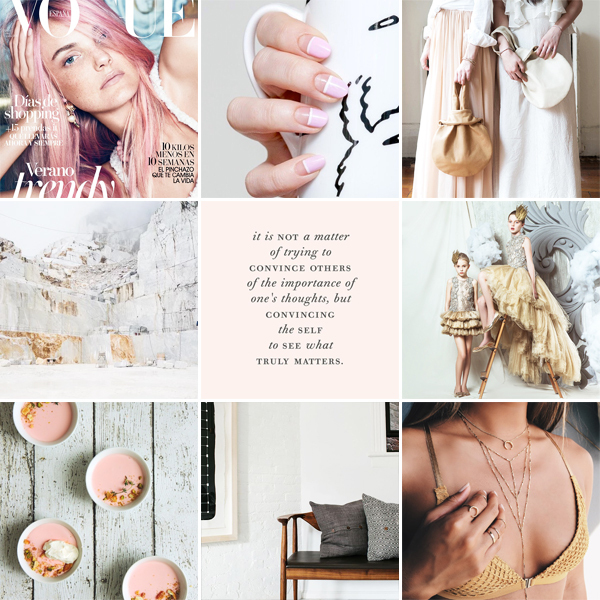 All the photos from Jenny's latest mood board post titled Exit Does Not Exist.